Sometimes I feel guilty acknowledging that fact. After struggling with infertility then losses of pregnancies, I feel like I should tout every single day I have with my kids as a blessing. And, yes, they ARE blessings. It’s true. Yet, blessings aren’t always easy, are they? I’m writing this blog post while sitting on a sectional sofa ¾ full of clean clothes. Yet, I think they may be the only clean clothes in the house at this point. From road trips to overbooked schedules, chores like laundry haven’t made the top ten of things to do each day. Remnants of slime projects taunt me on the ottoman, and I know more await me in the kitchen. My kids may have gone through an entire gallon of Elmer’s glue this summer. It’s been the Summer of Slime around here. My seven-year-old daughter glares at me because I made her come home from the neighbor’s house at 9pm. My eight-year-old was in the best mood until bedtime. Now random diseases are at work on her body because she CAN’T walk all the way up the stairs. Dishes line the counters in my kitchen. Until two hours ago, my husband didn’t have a pair of clean socks, but he was too sweet to complain. 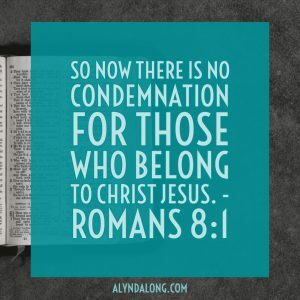 There’s no condemnation for those in Christ Jesus. Some days just look this way. Let’s face it. Some WEEKS just look this way. That’s what I keep telling myself over and over in my head, so I don’t fall into a miry pit of self-condemnation and utter depression. I mean it in the, “How in the world am I going to get out of bed today much less do All. The. Things. on my list?” sort of way. God’s here in the pit. He’s here in the laundry. He’s here with the kids and the bedtime routines and the never ending dishes. He’s even in the slime. It’s all throughout the scriptures, my friends. Think of the Bible “greats”. Most of them were hot messes too! God can use any of us. All it takes is the willingness on our part. 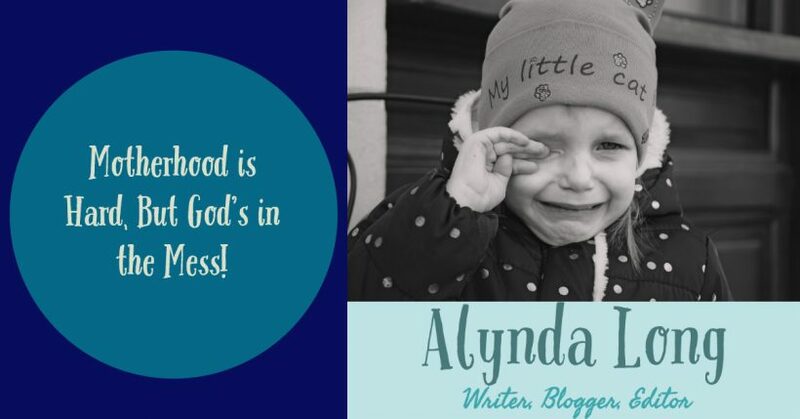 Motherhood is hard, but God’s here and that’s enough. 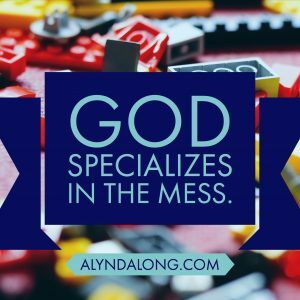 How has God shown up in your “mess” lately? Please share in the comments below! Thank you so much for your comment! Yes, the blessings definitely outweigh the hard times. It’s just difficult to have that perspective when we are IN the hard times. As I’ve heard numerous times, the days are long, but the years are short. Blessings to you as you enjoy being a grandmother. I have the sweetest boy who calls me “Nanny”. Such a great blessing!